The Vail Town Council is seeking input from the community on two draft friendship exchange agreements as it prepares to travel to Japan later this month at the invitation of officials from Yamonouchi-machi, located in the Nagano Prefecture of Japan. The agreements outline the town’s interest in strengthening ties to the Japanese tourism region which is listed as action item 4.1 on the Tuesday, Jan. 16 Town Council meeting agenda which begins at 6 p.m. in the Council Chambers with opportunities for public comment. Friendly exchange programming discussions with the Japanese representatives have been underway since last July when the Vail Town Council hosted an exploratory visit attended by Yamanouchi’s mayor and other Japan dignitaries. The 12-member visiting delegation participated in a formal meeting with the Vail Town Council on July 17 which included information exchanges on environmental sustainability, culture and tourism. 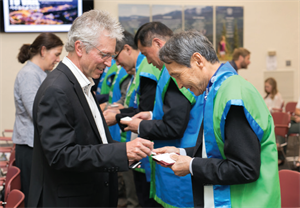 The official discussions will continue Jan. 20-26 during a reciprocal trip in which representatives from Vail will be traveling to Yamonouchi-machi to participate in additional information exchanges. A formal signing ceremony is also contemplated as part of the town’s interest in fostering cultural exchanges and idea-sharing across the globe in pursuit of stewardship excellence. The draft agreements include a memo of understanding to be executed by Yamanouchi and Vail, as well as an overarching agreement to be executed by Nagano Prefecture, as well. These agreements are to be considered at Tuesday’s Town Council meeting and help to identify the exploration and development of cooperative projects with Yamonouchi-machi in the areas of education, cultural exchange, promotion of tourism and environmental cooperation, as well as other topics. Joining Mayor Chapin on the trip will be Mayor Pro Tem Jenn Bruno, council members Travis Coggin, Kim Langmaid and Jen Mason, plus five staff members – Town Manager Greg Clifton, Town Clerk Patty McKenny, Economic Development Director Mia Vlaar, Environmental Sustainability Manager Kristen Bertuglia and Public Works-Transportation Director Greg Hall. Related travel expenses will be paid for the Vail delegates by the Town of Vail. Yamanouchi is Japan’s leading all-season resort which is visited by 4.6 million guests annually. It is home to Shiga Highlands, the biggest ski area in Japan, and was one of the venues for the 1998 Nagano Winter Olympics. One of the most unusual attractions is the Jigokudani Wild Monkey Park where snow monkeys can be viewed relaxing in a natural hot spring. In the summer, the area celebrates its culinary heritage and is also known for its nature, history and culture. While in Japan, the Vail delegation will be meeting with government officials from Yamanouchi-machi as well as Nagano Prefecture, plus tourism and industry representatives. The itinerary includes two business meetings on Jan. 25. The first meeting will be hosted by Yamanouchi-machi Mayor Yoshitaka Takefushi and his resort community counterparts. The second meeting will take place in Nagano City hosted by Governor Shuichi Abe and representatives from Japan’s international affairs, tourism and international exchange offices. In addition, the delegation will meet with the chief commissioner of the Sports Agency of Japan based in Tokyo, an agency responsible for promoting the 2020 Tokyo Olympics and Paralympic Games and a mission to help broaden the international commitment to sports competitions. Other activities will include sightseeing tours to the Jigokudani Wild Monkey Park, Matsumoto Castle, as well as skiing at Yakebitaiyama. The delegation will also be experiencing a travel itinerary that highlights advances in transportation including a direct flight from Denver International Airport to Tokyo via United Airlines which has been in place since 2013 as a result of an initiative forged by Denver International Airport and the Metro Denver Economic Development Corporation. The Vail group will also be using the “Bullet Train” to travel between Nagano and Tokyo, a connection that was built to accommodate spectators attending the 1998 Nagano Olympics. The Vail-Yamanouchi-Nagano business meetings will be facilitated by Souichi Nakamura, president of the Denver-based Interpacific Network Corporation, an international business development company that has assisted in previous discussions. The State of Colorado’s relationship with Japan is one of its strongest and most important international partnerships. This relationship has been strengthened over the years with the establishment of the Consulate-General of Japan in Denver, as well as bilateral trade missions, including a 2015 mission to Japan, led by Gov. John Hickenlooper, as well as a 2016 delegation to Colorado led by Governor Abe. Japan is also one of Colorado’s strongest international economic partners; the country ranks as the state’s 4th largest trade partner and nearly 50 Japanese companies operate out of Colorado. Vail currently enjoys a friendship exchange relationship with San Miguel de Allende, Mexico, which has resulted in two delegation exchanges, a culinary exchange hosted by Sweet Basil and attendance at a writers’ and literary conference in San Miguel de Allende by two members of the Vail Commission on Special Events and a community member. In addition, the town acknowledged its long-standing relationship with St. Moritz, Switzerland, created in 1982, when it hosted an information-exchange with Swiss officials during the Alpine World Ski Championships held in Vail and Beaver Creek in 2015. In 1997, a relationship was forged with Delatite Shire/Mr. Buller, Australia, which has included a series of student and employee exchanges.